Christmas and Coke® have been a natural pairing since the Coca-Cola® Santa first appeared on the scene in 1931. You can add a refreshing touch to your holiday decor with this first-ever replica Coca-Cola® bottle handcrafted in genuine crystal. 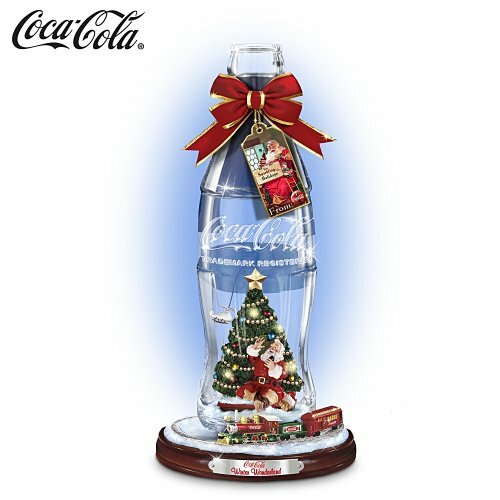 Inside the bottle is a sculpture of the world-famous vintage Coca-Cola Santa in the style of acclaimed artist Haddon Sunblom, who created the original Coca-Cola Santa advertising art.This limited-edition Bradford Exchange exclusive figurine is filled with holiday touches. A real fabric bow with golden trim adorns the top of the bottle, and a gift tag featuring another faithful reproduction of Haddon Sunblom's Coke art hangs from the bow. And with the flip of a switch a miniature Coca-Cola express train circles the base to deliver more holiday cheer. Makes a unique Coca-Cola gift. High demand is expected for this Coca-Cola first, so order now!California Residents click here for Proposition 65 notice. All information has been created with meticulous care. However, I cannot assume any liability for the up-to-dateness, completeness or accuracy of this information. Some content that appears on this site was made available by our partner companies (Affiliates). All this information are as is and may be changed or removed at any time.